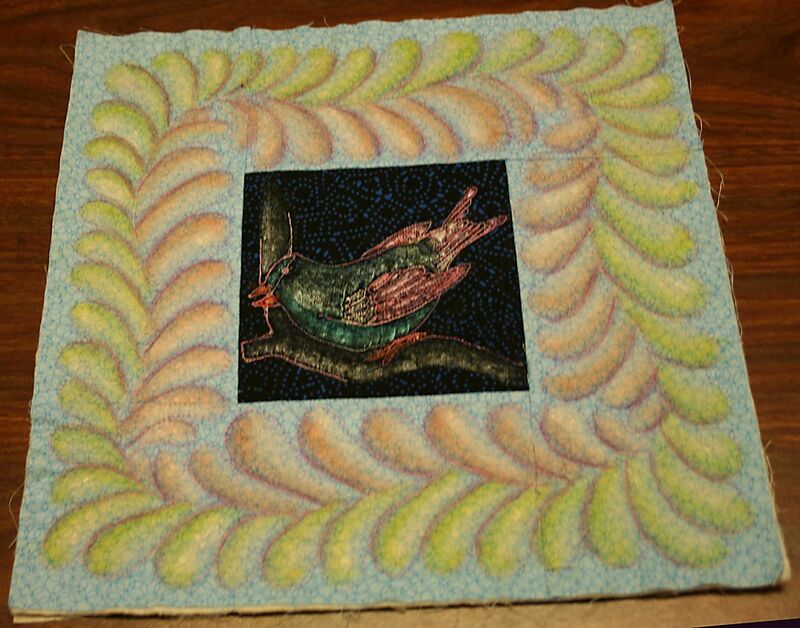 This is a most excellent example of how to use gem stones in a fiber piece. 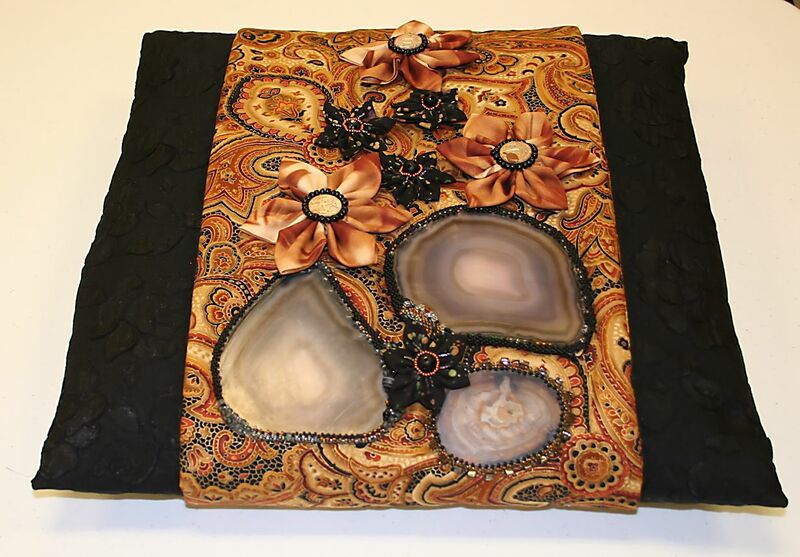 The sliced pieces of Jasper are held in place by rows of hand beading, and the flower centers are rounded mineral pieces surrounded by beads. Aside from the beautiful original design, that is a removable pillow cover. How versatile is that? It’s stunning wrapped around the black pillow, but it would be equally dramatic with a cream satin pillow or a warm taupe. We’re all hoping she will be entering this in the upcoming Rochester Gem, Mineral, Jewelry and Fossil Show & Sale to be held at the Main Street Armory, October 26-27, 2013. 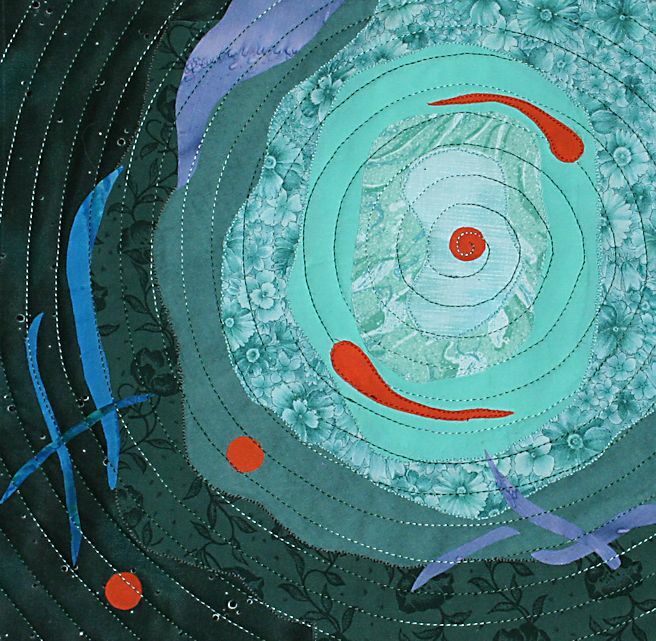 Speaking of that show, there will be pieces made by members of Genesse Valley Quilt Club, and the Rochester Area Fiber Art group. It’s going to be a spectacular show. If any of my readers will be in the Rochester, NY area that weekend, it would be a great idea to add it to your “must see” list. Admission is $6 and kids 12 and under ree with an adult. Speical 2 day pass is only $9. Yesterday was our monthly meeting and it was another good one. 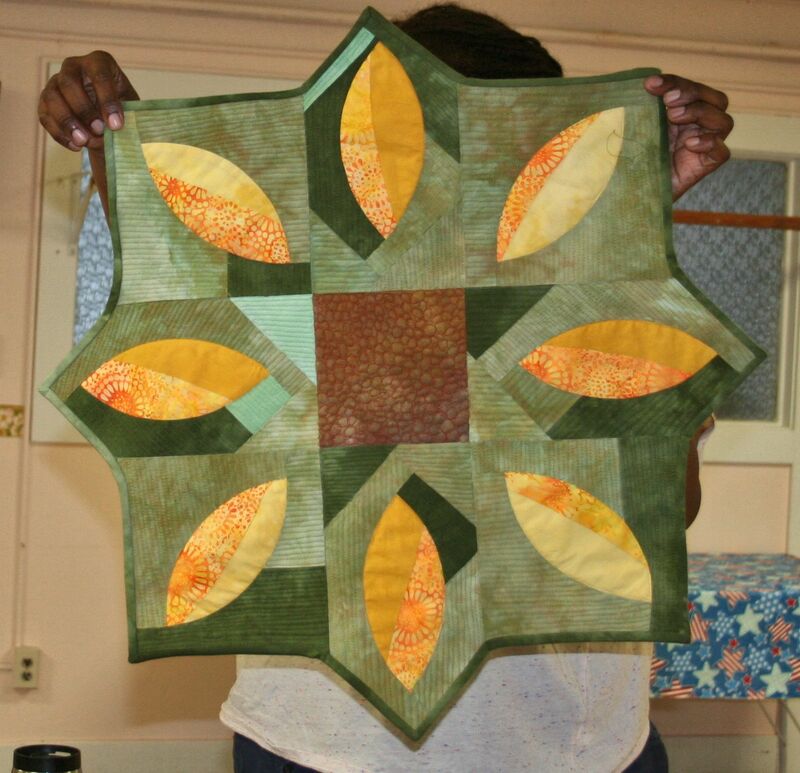 The stylized sunflower design was very appealing, and the quilting was terrific. 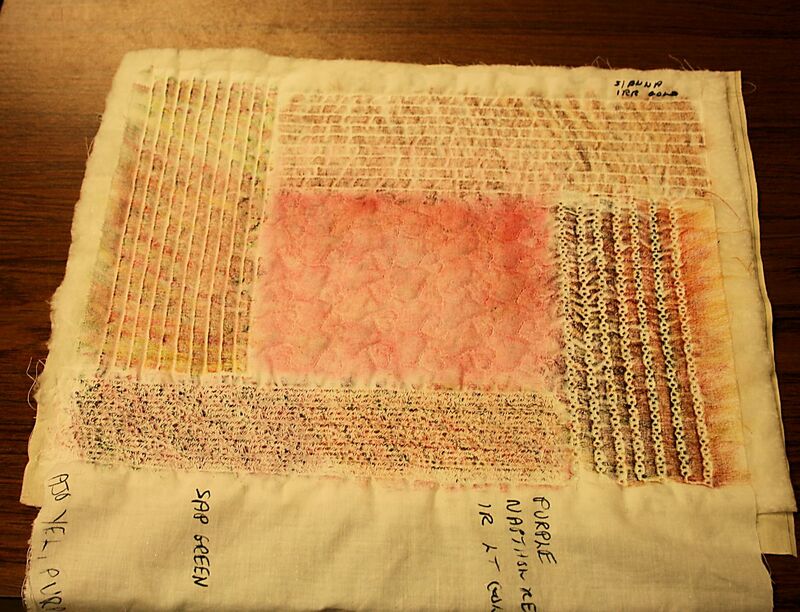 The first picture is the back, so there was lots of piecing involved in this project. I love the bright colors. but that grafitti piece was so distinctive. And check out that T-shirt she is wearing. I’d never seen anything like that. The comfy cotton t-shirt styling, with the delicate lace, and the blue undershirt – a textural playground, and always something interesting for your eye to see. I liked it. I liked it a lot. After the meeting I went out to lunch with 6 of my friends, and it was a pleasure sharing a meal, good conversation, and a short stroll through the village with them. The sun was shining, and the humidity had finally gotten down to a comfortable level. It was a good day. My wishes for all of you is to have good days in your life too. The first version of this piece was pretty hideous. I added some movement by adding the orange squiggles, and showed it to my art group today. I still didn’t think it was right. They suggested I turn the piece. What a difference that made. Now I love the piece. Thank-you ladies!!! 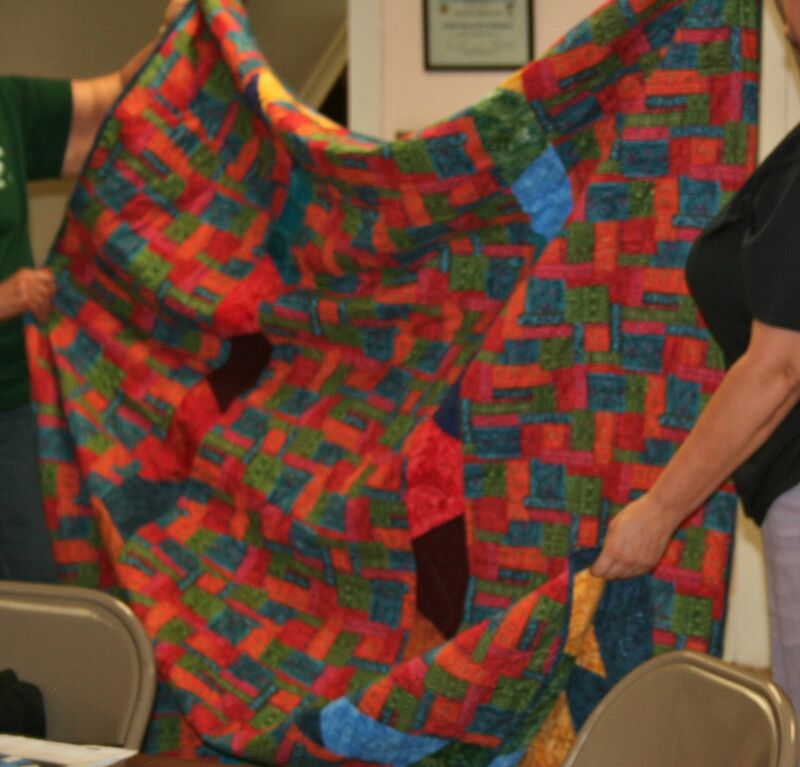 There are still more small quilts to come from that class too. I’m going to redo lesson 6, and still have lesson 8 to complete, so stay tuned for the conclusion. This post is linked to Nina Marie Sayres Off the Wall Friday. We had a small gathering Saturday, but it was a good one. 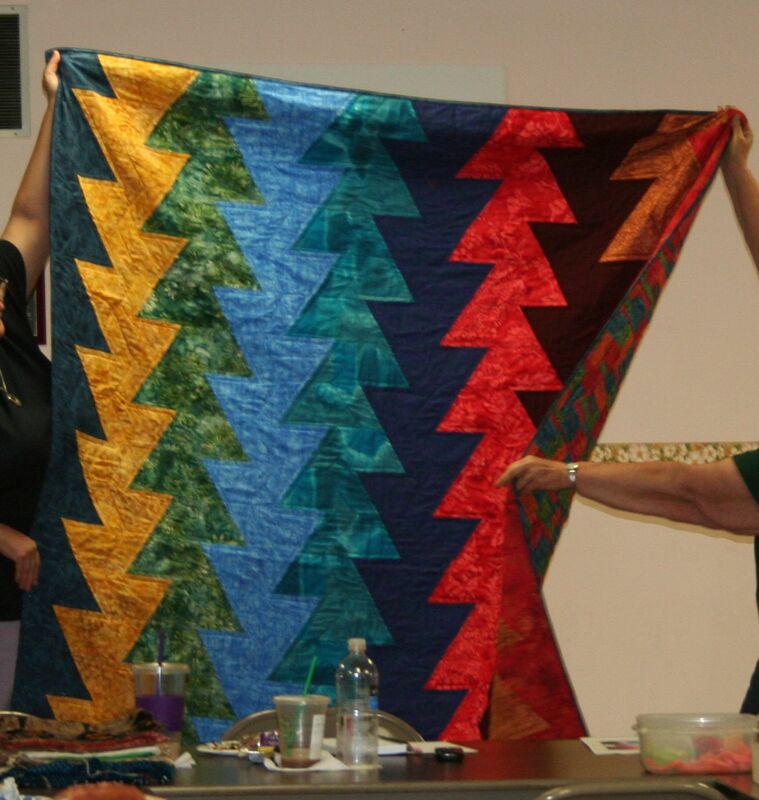 Kathi, Steph, Sue, and myself were the only members who could make it, and Steph gave a demo on how to use Shiva Paintsticks on a quilt. 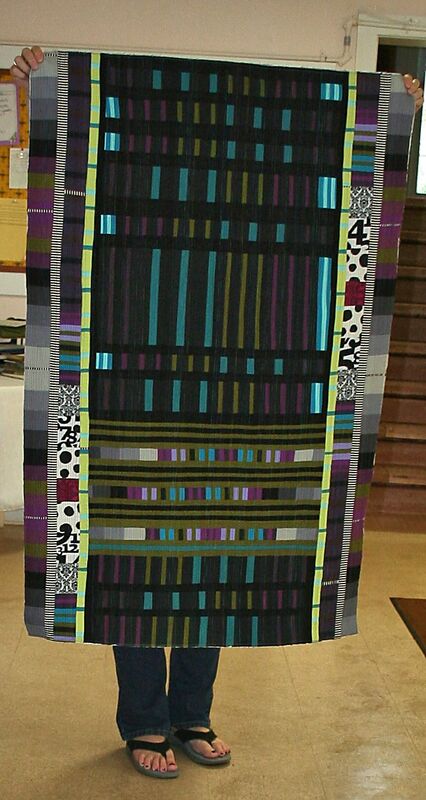 Now I don’t know too many people who would take a finished quilt and start applying paintsticks to it willy nilly. Trying this on our small pieces with a “what if” attitude was totally freeing, and was a lot of fun. 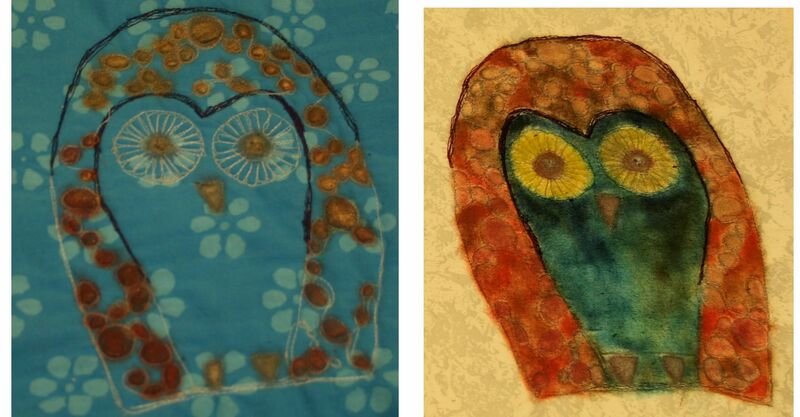 Kathi didn’t have time to make a small quilt, so painted on flat fabric. She masked it off with blue painter’s tape – something we all should own. We used stencil brushes and smooth oil brushes to apply the Shiva paintsticks, and even Q-tips. Sometimes we used the paintsticks like a pencil, and sometimes we took the wrapping off, and rolled the entire stick across the piece. We used colors on top of colors, irridescents, student grade and professional grade, and realized the difference between the two grades was just the color assortment inside the box. Steph had a blender paintstick too, but I’m not sure if anybody ever used it. 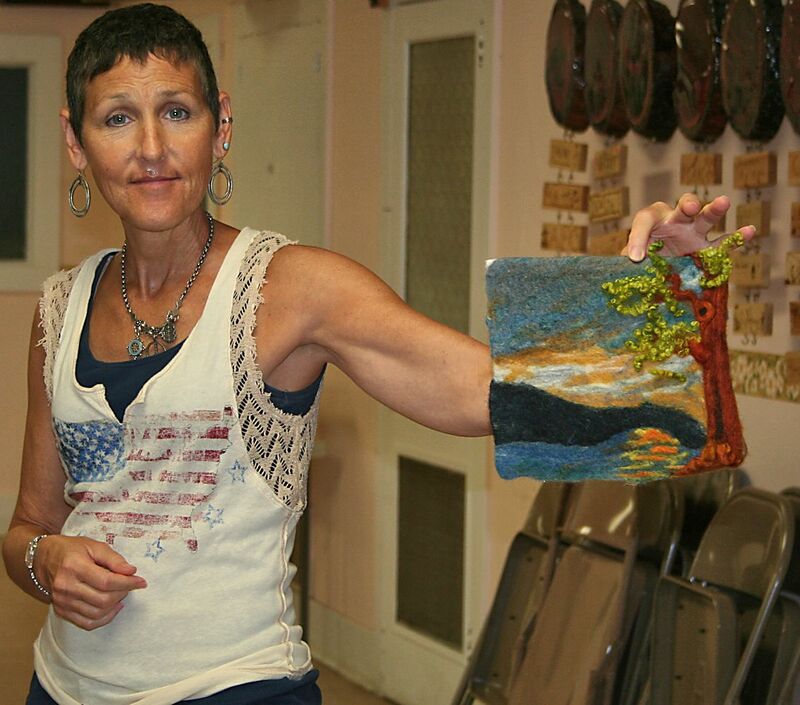 I wasn’t all that thrilled with my piece, but then I never am thrilled with anything I do in a workshop, and have learned to embrace that fact. I’m way too socially oriented, and have a tendency to enjoy the company, instead of focusing on creating something I like. Don’t misunderstand that though. I learn from every workshop I take. I listen, I take notes, and I’m a good student, but I don’t do my best creating in a workshop, and that’s okay. It takes me time to assimilate what is presented. 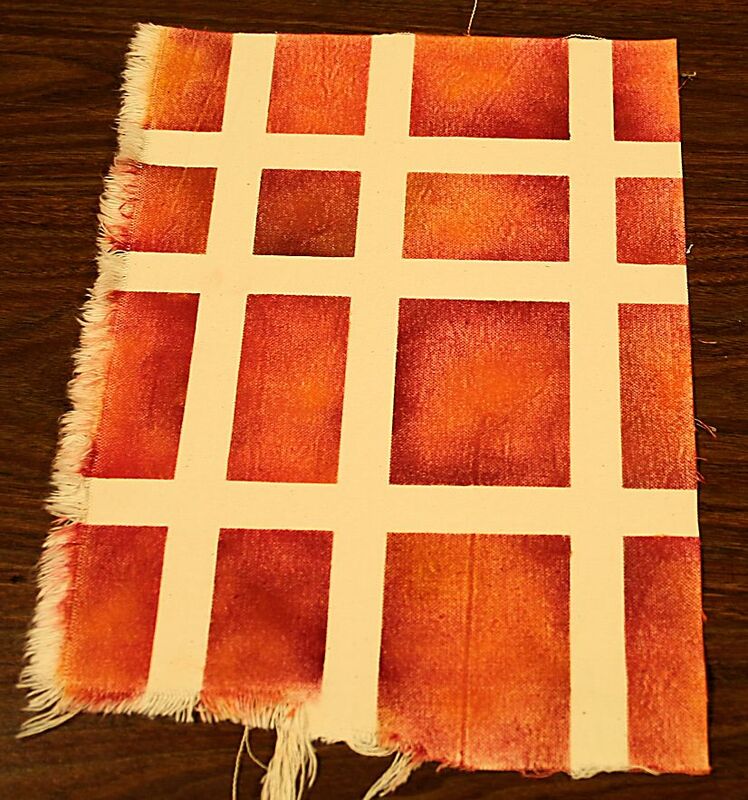 All the fear of maybe ruining a finished quilt by trying to paint it, is now gone, because I know what type of quilting is enhanced by the paint stitcks, and what kind doesn’t work all that well. I also know – for me – I’d test the color combinations before I started painting. All that writing on my little sample are the paintstick combos I used for the areas I liked. So if any of you have some Shiva paintsticks, get them out of their box and play with them. You don’t have to use them just with those rubbing plates we all own. 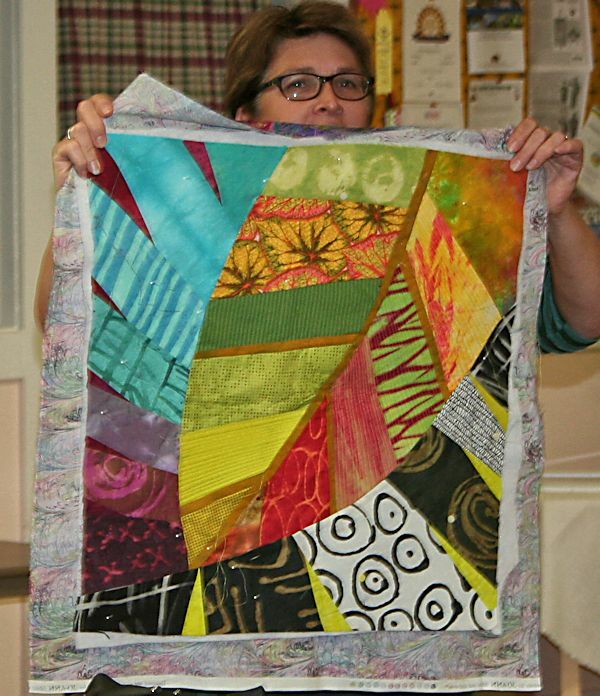 Add some color to a quilt, make some new fabric of your own design, but most of all, just get them out and use them. Last week, even though it was still June, I kept on thinking it was July. On Monday I almost went to a doctor’s appt, and on Thursday, I drove 30 minutes to attend an art group meeting – which wasn’t that day. 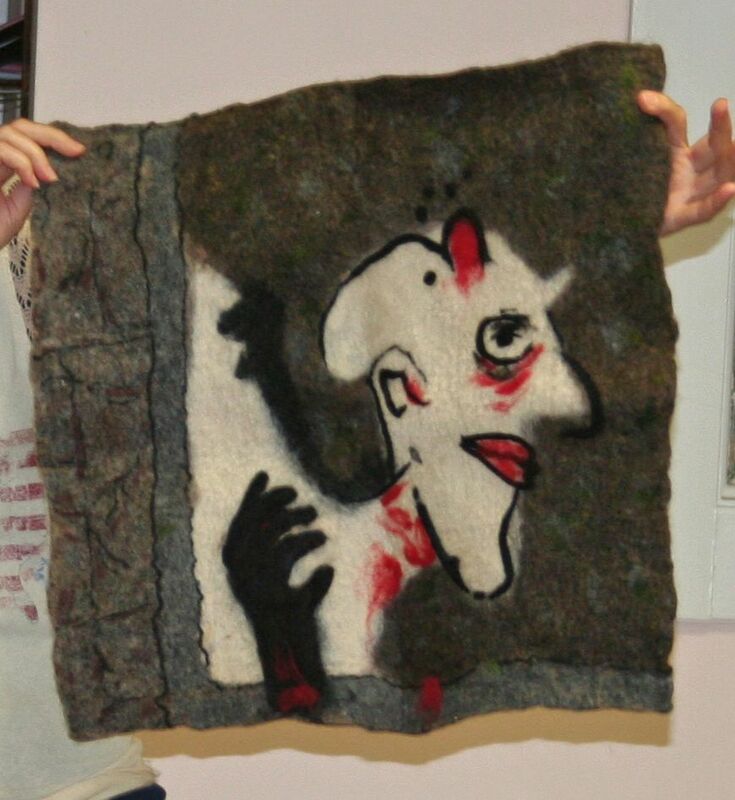 Instead I got lucky and visited a felting group that meets the fourth Thursday of the month in the same location. All the members also happen to be members of my art group, so we had a good laugh, and I got to see some lovely works in progress. 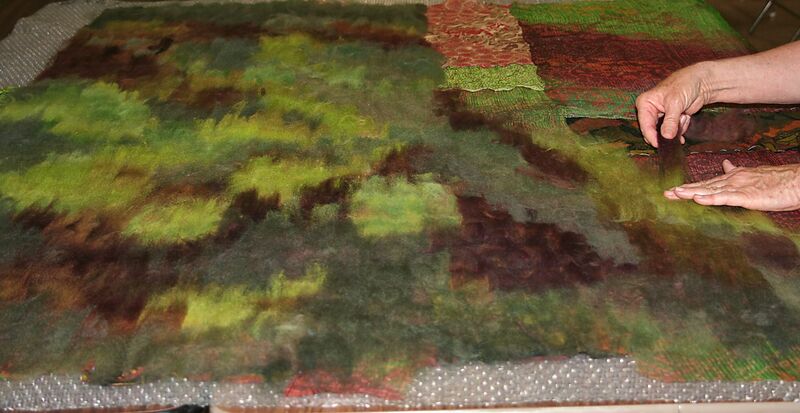 It was fascinating to me to see how felted fabric is created. First you start with a layer of bubble wrap, then some silk fabric, then wool/silk roving was next, then a layer of sheer fabric. 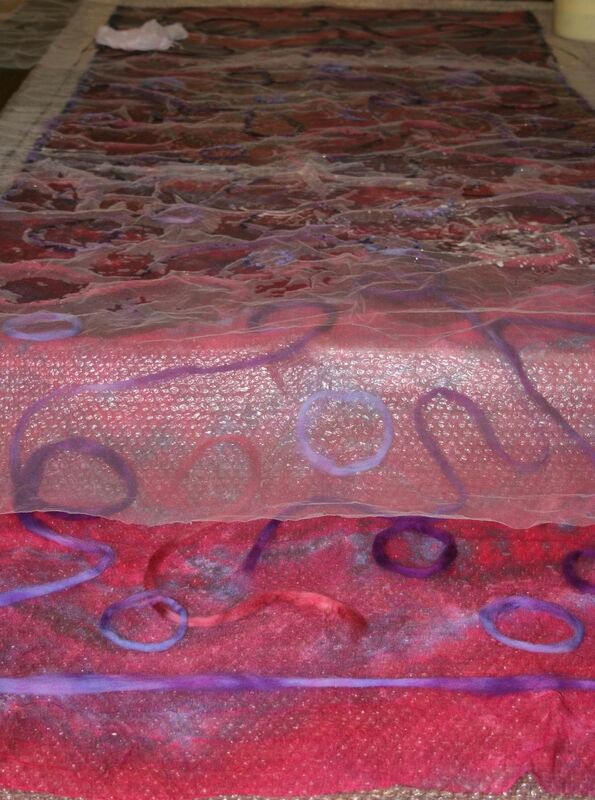 The next step was to soap it all up, and roll the wet fiber package over pool noodles. This was the first time I’ve seen this process, and found it fascinating. 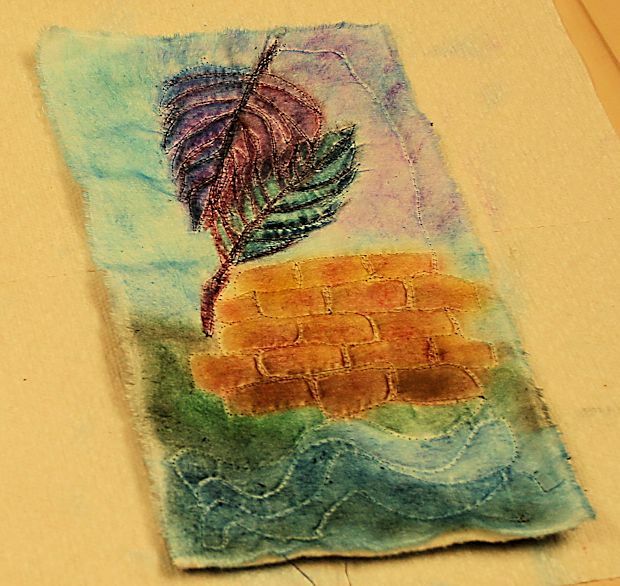 Gorgeous, earthy shades that will be made into sleeves for a garment she has started. You would not believe how chubby that piece started out. The soapy water really condensed the roll. 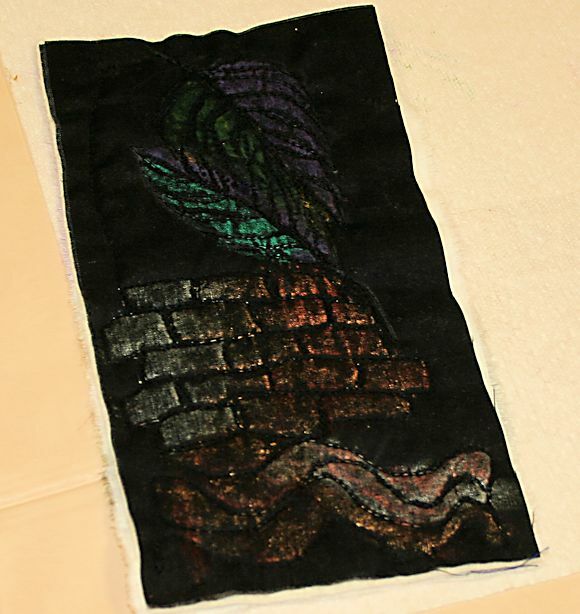 Felting is something I might try in the future, but for now, I’m focusing on getting another piece completed for KatiePM’s class. And thank-you ladies for letting me stay and visit so long. It was an enjoyable outing.